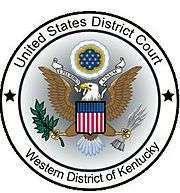 The United States District Court for the Western District of Kentucky (in case citations, W.D. Ky.) is the federal district court for the western part of the state of Kentucky. Appeals from the Western District of Kentucky are taken to the United States Court of Appeals for the Sixth Circuit (except for patent claims and claims against the U.S. government under the Tucker Act, which are appealed to the Federal Circuit). Jurisdiction includes the following Kentucky counties: Adair, Allen, Ballard, Barren, Breckinridge, Bullitt, Butler, Caldwell, Calloway, Carlisle, Casey, Christian, Clinton, Crittenden, Cumberland, Daviess, Edmonson, Fulton, Graves, Grayson, Green, Hancock, Hardin, Hart, Henderson, Hickman, Hopkins, Jefferson, LaRue, Livingston, Logan, Lyon, Marion, Marshall, McCracken, McLean, Meade, Metcalfe, Monroe, Muhlenberg, Nelson, Ohio, Oldham, Russell, Simpson, Spencer, Taylor, Todd, Trigg, Union, Warren, Washington, and Webster. The following counties are in the Louisville Division: Breckinridge, Bullitt, Hardin, Jefferson, LaRue, Marion, Meade, Nelson, Oldham, Spencer, and Washington. The following counties are in the Bowling Green Division: Adair, Allen, Barren, Butler, Casey, Clinton, Cumberland, Edmonson, Green, Hart, Logan, Metcalf, Monroe, Russell, Simpson, Taylor, Todd, and Warren. The following counties are in the Owensboro Division: Daviess, Grayson, Hancock, Henderson, Hopkins, McLean, Muhlenberg, Ohio, Union, and Webster. The following counties are in the Paducah Division: Ballard, Caldwell, Calloway, Carlisle, Christian, Crittenden, Fulton, Graves, Hickman, Livingston, Lyon, McCracken, Marshall, and Trigg. The United States District Court for the District of Kentucky was one of the original 13 courts established by the Judiciary Act of 1789, 1 Stat. 73, on September 24, 1789. At the time, Kentucky was not yet a state, but was within the territory of the state of Virginia. The District was unchanged when Kentucky became a state on June 1, 1792. On February 13, 1801 the Judiciary Act of 1801, 2 Stat. 89, abolished the U.S. district court in Kentucky, but the repeal of this Act restored the District on March 8, 1802, 2 Stat. 132. The District was subdivided into Eastern and Western Districts on February 12, 1901, by 31 Stat. 781. The court is based in Louisville and also holds sessions in federal courthouses in Bowling Green, Owensboro, and Paducah. The United States Court of Appeals for the Sixth Circuit in Cincinnati, Ohio maintains appellate jurisdiction over the district. Its court in Louisville is located at the Gene Snyder U.S. Courthouse. The United States Attorney's Office for the Western District of Kentucky represents the United States in civil and criminal litigation in the court. The current United States Attorney is John E. Kuhn, Jr.; his predecessor, David J. Hale, was confirmed as a federal judge for the Western District of Kentucky on December 3, 2014. ↑ Reassigned from District of Kentucky. ↑ Asbury Dickens, A Synoptical Index to the Laws and Treaties of the United States of America (1852), p. 391. 1 2 3 4 U.S. District Courts of Kentucky, Legislative history, Federal Judicial Center. ↑ "Hale confirmed as federal district judge". The Courier-Journal. Retrieved 4 December 2014.